Emil Băcilă was a prodigious professor (a quality highly appreciated by his colleagues), strongly preoccupied by methods and didactics in art study. He was strongly influenced by the sharp intuition of the abstract, of the rational artistic spirit transforming each lesson and artwork in a demonstration of analytic and synthetic virtuosity, as Paul Klee had done several decades before. Emil Băcilă dedicated himself to the teaching of arts and rejected the idea of executing political artworks or exibiting where the political and aesthetics censorship was promoted by the political regime. 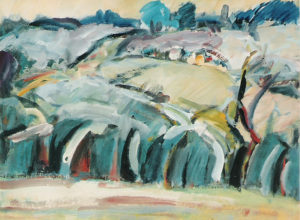 Like Bene Jozsef, his professor and colleague, Emil Băcilă began to practice the technique of watercolor which offered him a wide liberty of expression and made him get plastic performances; the alternate use of watercolor and tempera helped him to experiment with the humid and dry medium of the pigment. The watercolor was still considered a “minor genre”, a “study”, an “exercise” of the masterpiece, and was not considered as a threat to the political system. Consequently, the artist could use it without being disturbed by the insolence of the political system which was promoting a senseless, propagandistic art. The artist had to return to his “original” tools, in order to create in a reactive, flexible environment which put a light on virtues such as sensitivity, lightning emotion, gestural reaction; the striking dexterity of the hand was touched by the miraculous perception of the eye. 3. the instinct as a form of irrationalism. In the creation act all those three elements are participating by acting in different forms and variations – as manifestation of vitality. This manifestation of “vitality” in creation uses intelligence to put order in the vital instinct and activates the “torpor” state of the human eye – inactive at his contact with the nature; it arouses the human desire to project new worlds which can be discovered and expressed only through artistic activity. In Romania, Bergson’s theory was strongly promoted by the philosopher Lucian Blaga who developed a special anthropology by projecting the Romanian traditional space (the “mioritic” horizon) as a space visually belonging to the Romanian world that the artist tried to order in his attempt to use intuition as a tool of plastic knowledge. From there the need of cooperation between types of knowledge – intuition and intelligence – exercised during the creative process. Without conceptually expressing a theory or a scientific methodology, Emil Băcilă understood that the creative process had to be built on a systematic knowledge of human nature, away from the fragile stereotypes of Marxist ideology; the artist was aware that any naïve ambition to argue with an ideological educational system and an oppressive political regime would make him being formally denied by the adepts of the socialist realism. His plastic theories transformed in work of art – a place to apply the methodology of artistic creation. His theories were expressed in his watercolors in a remarkable way; the technique of watercolor offered him the possibility to express his lightening thoughts and to shroud his theories in certain discretion. Instead of using words, he preferred to sit in front of a blank sheet of paper and to create, as the master of Bauhaus had done before. The rationality was not the only aura of the artistic act and the work process was not the only instinctive way to produce objects and art any longer. As for the artwork, this was not the stage of political ideologies, but a geometrical place where the artist could express himself as an individual. 1. When we look at Emil Băcilă’s watercolors, the first impression is one of a strange restlessness; the viewer can feel the absence of corporality in the sense of “weight” of objects and forms which seem to be floating. These are strictly related to the idea of bi-dimensionality of the work of art; an object seems to be a projection, a figure in a world where the visual perception forgot the principles of “universal attraction” law – which Newton enunciated after watching an apple falling on a grassy meadow. This strange effect creates the sensation that Emil Băcilă’s flowers, vases and trees “climb” to the sky, away from the contingency of the real; his objects lose the consistency of real things and become floating chromatic impressions. 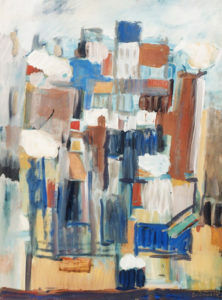 The compositional plans pursuit a clear compositional geometry, they overlap and intersect with eloquence, like anchors which retain the volumes into the painting, but, at the same time let them… float over our heads. Everything seems alive and moves like a troubling shadow; the plastic forms are animated by the currents passing through the double-leaf windows and doors and follow the incoherent dynamic of the volute atmosphere. 2. As the artist does not use this function of light in order to create the volume, his creative interest is assured by the flat representation; we will see that he gives up to some of the essential qualities of the chromatic model: he rejects any temptation of representation of volumes or surfaces, by using the light-shadow modeling and by dissimulating the tactility of color using the brush. It is remarkable how he is exulting the plastic values which are created through anti-pictorial “effects”. (Flowers in a red vase, Vase with poppies, Red bouquet). The texture imitates the carpets warp and recomposes the chromatic surfaces of the watercolor through chromatic and graphic modulation: the background interstices create a sensorial canvas; the strokes become instruments animating the surfaces and create a special dynamic. Some of them imitate the stiff surfaces of old rugs, some others receive the diaphanous exuberance of silk, while others simply populate a dynamic of color “touch” obtained by the rough strokes of a flat brush. In short, the artist obtains an expressive and visceral value. Such a personal and diverse application of effects amplifies the game and the technical dimension which leads to another type of mimesis – an indirect one, emphasizing on the language logic. We might ask how much of this creation is an experiment, how much of it is ludic disposition and how much of it is technical expression based on inventiveness and originality. All those elements seem to recompose in a unique experience through the incantation of joy and creation. Emil Băcilă’s plastic synthesis left behind the original visual reason, in order to express a richness of lights and transparent forms which carry us on the dreamy wings of expressivity. 3. Another interesting aspect of his art is revealed through the chromatic. His colors range in a cold registry (green and blue); he often uses ground colors (ocher, burnt sienna, natural shade, etc.) His concern for cold dominant colors leads to a prodigious exercise, translated in the use of demi-tints, a grey chromatic; this used to be an academic exercise practised by the artists of the School of Cluj, becoming its characteristic, in time. Those artists respected the modern tradition (bourgeois) which was not affected by the “sauvage” adventures of the Expressionism, Post-expressionism, Fauvism, by the deformations of Avant-garde or by the “purism” of Neo-cubism. Aspiring to the status quo of aristocrats – at least as “aristocrats of the bourgeois spirit” if not as “princes” of intellectual elites – those artists were mostly repugnant in front of polemic violations of “revolutions” in art and preferred a comfortable condition under the protection of “authorities”, often making use of compromises to keep a good relationship with the political regime. 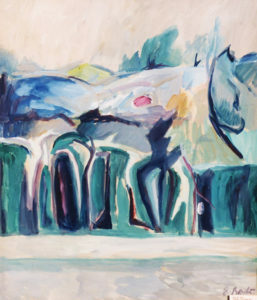 They accepted the “intuitive theory of color” from the beginning of the 20th century, but they belonged to another class and tried at the same time to convince the authorities or the Maecenas about the fury of Fauves or the truth of Cézanne, the painter from Aix-en-Province who was a wealthy aristocrat. In their way, they were “revolutionary” and tried to change the artistic taste, step by step, through reforms and using an ardent speech disapproved by the ladies from the high society. They preferred to accept the less educated taste of collectors who became the first Maecenas. The strong interference of the politics in the artistic message after the 2nd World War affected the ethnical relationships and the benign nature of professional beliefs of the artists. The creation of the new “socialist school of art” could affect only partially the artists’ position towards the creation and the new school had to become an “art factory” serving a new master – the working class and the peasants. Artists would continue to work upon the tradition of modern schools of art, but would accept to give up their principles when the political power had commands for them. Their art was based on the honorable commercial principle of “fifty-fifty”, accepted by both sides; artists would continue to create according to their own principles, but, when necessary, they would follow the “orders” of the new Maecenas. 4. Emil Băcilă would graduate the School of Cluj and would try to “produce” artworks in the style promoted by the authorities. In fact, all the graduates were directed toward this way – as a solution in reaching the social standard of a material comfort embraced by the bourgeois artist. When the political system changed, the artist has lost this status and he was promised the subvention of his creation by the political regime. Thus, artists would enter the large category of employees, sacrificing their professionalism in order to assure their life. They would continue to apply the principles of modernity only when the academic principles of the old bourgeois school did not colide with the new ideas of socialist realism, strongly promoted by Andrei Zhdanov or Sergei Gerasimov. The art professors from Cluj would pass over this ambiguity and constructed an art based upon classic compositional principles. 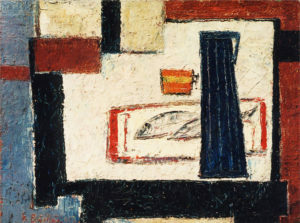 Through decorative arts, Emil Băcilă was one of the artists who distilled the color and used the influences of western Avant-garde, represented by Paul Klee. He proved a remarkable professionalism and preferred a chromatically refined art with constant references to the models of interwar art. 5. After 1965 (Nicolae Ceaușescu was elected General Secretary of the Romanian Communist Party), when the creation act was liberalized, the political system allowed the development of relationships between Romanian and Western artists. The relationships with the political system were cordial and there was an encouragement of original forms of expression, many of them bold; thus, notorious artists emerged and attitudes and artistic expressions animated by the sentiment of liberty appeared in this climate of social prosperity. The scope of the artist’s exhibitions and social prestige had increased significantly; the young people following art studies were no longer threatened by an art promoting only social and political values. It seemed to be the most fertile period for Emil Băcilă; as a professor he became the exponent of the modern art principles acquired through study. He tried to elaborate a teaching system based on the advantages offered by the political principles, but promoting the freedom of personal development; his method emphasized on the traditional culture, on the profound knowledge of Romanian realty and on the philosophical determinations of the Romanian space, in consonance with Western ideas. 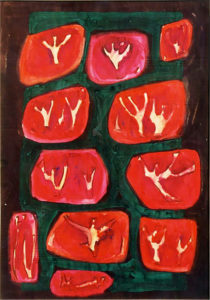 Emil Băcilă had maintained the relationship with the professional world outside the school and continued to exhibit during individual and collective events, ignoring any interference of the political message in his artworks. He focused on the functionality of artistic education, emphasizing on professionalism and on method in teaching arts. 6. Emil Băcilă was a professor, dean and finally rector of the Fine Arts Institute in Cluj and he continued to work in this institution, in spite of the cynic decision of the political system to implement the National Festival “Cântarea României” (Praise to Romania); this yearly cultural festival (1976-1989) intended to promote ideologically manifestations, featuring both professional and amateur artists from across the country. For professional valued artists this pathetic junction between professional and amateur artists proved to be destructive, as long as “assertive” individuals, with no relationship to art values were elected to rule the art departments inside the political system; thus, they destroyed the hierarchies built on experience and professionalism. 7. The most prolific creative period for Emil Băcilă was during the last decade of his life. The 80s meant for him a time of shiny concentration, a reflexive period of enormous energy at the artistic level; he emphasized on artworks in which the formal and chromatic synthesis brought him closer to Paul Klee’s art principles. This lack of cultural consensus which characterized the time marked profoundly the soul of this passionate person who witnessed the ruin of modern art values. Driven by an underlying shyness, devoid of the violent temper of a fighter, Emil Băcilă focused in a delicate balance on the delicacy of the paper as a medium for his art, transforming it in a valuable weapon against a disoriented world that lacked any moral and professional hierarchy. After decades of professional experience, having based his art on strong principles, his watercolors present the profile of an elegant “physiognomy” and the form of a shiny expression. His professor, Bene Jozsef left Romania and this ideological delirium that characterized the world of art and took refuge with his family in Ulm (Germany). The Romanian society announced strange cataclysms felt by the artist Emil Băcilă. Despite this uncertainty, the artist developed through his art a passion for the great themes of humanity. The poetic of his watercolors has the eloquence of a political speech, speaking about modernity and tradition in a world less willing to bear in its mind the benign erudition of historical times: his watercolor have the poetic splendor of colorful manifesto and reveal the universal ideas that animated the human sensitivity. Some time ago, Paul Klee – the master of art – suggested that his intention was not to educate specialists or to form genius, but to encourage the young people to acquire a new knowledge of optical expression by using a vocabulary that each should verify and develop. The sad self-portrait of the old artist represents the final point of a sensitive artwork floating over our heads, like the images in the Japanese prints.